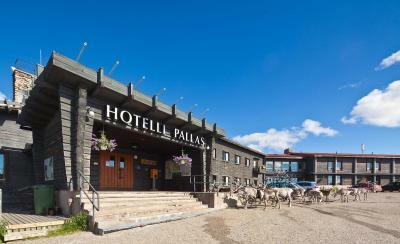 Lock in a great price for Lapland Hotels Pallas – rated 8.3 by recent guests! Beautiful location in the middle of nature with reindeer running around the hotel and parking, real fun to see these animals going around and in all directions. Amazing. The view from the hotel is stunning and the hotel is the perfect starting point for long fell walks. We enjoyed it a lot. A very relaxing atmosphere and very helpful staff! 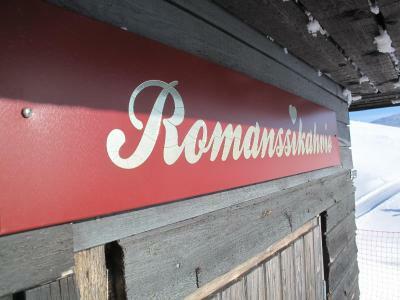 A great place up in the Finnish mountains. Endless forests, and a fine place in the middle of it. Well organised. Good food. Food was excellent! I like the restaurant, the atmosphere especially. location is pretty cool. The staff is friendly and the restaurant serves good breakfast and meals. Lovely location! Quiet hotel, no unnecessary radio/music noise. Thank you! Nice personnel. Service was very friendly and professional. The dinner in the restaurant was excellent. Surrounded by spectacular nature. Söin kaksi kertaa burgerin ja oli todella hyvää!! Sijainti on tietysti loistava! Paikan historia ja henki huokuu seinistä!! Upea sijainti. Onhan hotelli vähän kulahtanut mutta se on osa sen viehätystä myös. Hyvä aamiainen ja toimiva miesten sauna, jossa oli pitkät aukioloajat ja jossa pääsi kertaamaan muiden kanssa päivän hiihtoretket. Ystävällinen henkilökunta! Erinomaisen monipuolinen aamiainen, lappilaisia makuja. Päivällinen toimi hienosti ja ruoat herkullisia hinta-laatusuhteen ollessa kohdallaan. Rauhallinen ympäristö, hyvä vuode, ystävällinen henkilökunta, upea luonto. Retket Pallaksen Pöllöjen kanssa olivat ihan parasta antia! Lapland Hotels Pallas This rating is a reflection of how the property compares to the industry standard when it comes to price, facilities and services available. It's based on a self-evaluation by the property. Use this rating to help choose your stay! 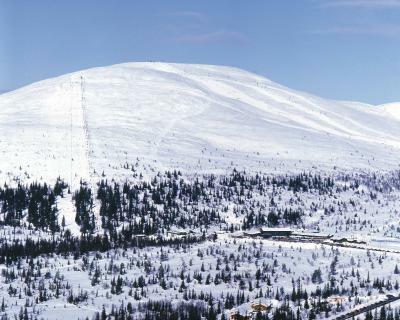 This traditional Alpine hotel is in the unique landscapes of the stunning Pallas-Yllastunturi National Park and the ski center includes a ski rental store, ski maintenance room and ski storage facility. The untouched Alpine countryside provides spectacular scenery and easy access to cross-country skiing trails, downhill skiing or the possibility to view the Northern Lights trips. During summer, trekking and hiking trips can be undertaken into the National Park. 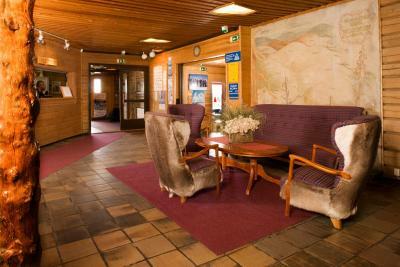 Lapland Hotels Pallas has a log restaurant and bar with a cozy atmosphere as do the cozy living areas and the library. The sauna is located on the banks of Vatikuru Pond and is the perfect spot to warm up before taking an invigorating plunge in an ice hole. This property also has one of the top-rated locations in Pallastunturi! Guests are happier about it compared to other properties in the area. This property is also rated for the best value in Pallastunturi! Guests are getting more for their money when compared to other properties in this city. 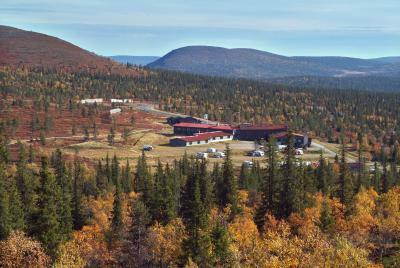 When would you like to stay at Lapland Hotels Pallas? House Rules Lapland Hotels Pallas takes special requests – add in the next step! Lapland Hotels Pallas accepts these cards and reserves the right to temporarily hold an amount prior to arrival. No WiFi in the rooms, only in restaurant and lobby. No beds for couples!! Single beds only :( Rooms old, dated, worn out... but really clean. No sport clothes to buy. Too much lights outside to look for stars properly. Bathroom was quite small, a bit larger would have been comfortable. The paint was dropping from the wall of my room. It just gives sad first impression and shows that the owner is not willing to invest a penny in this property, and not even making an effort to maintain it. Really unacceptable for a room which cost me 108eur for single occupancy. When i complained at the reception, they could offer me another room but it was not better. Second biggest issue was that the room description promises 'mountain view' but in reality there was a broken mosquito net and a parking lot. That was not a problem for me but could be for someone else. So unfortunately i will never return to this place as there are alternatives which are well maintained properties.